Buy Sporting Lisbon Tickets Now! Sporting Lisbon 2018/19 Tickets Are Available! Founded: 1906. Nickname: Leões (Lions), Verde e brancos (Green and whites). All Time Top Goal Scorer: Peyroteo (544). Based In: Lisbon, Portugal. President: Frederico Varandas. Overall Most Appearances: Hilario (494). League: Primeira Liga. Manager: Marcel Keizer. Main Rivals: SL Benfica, FC Porto. Venue: Estádio José Alvalade. Captain: Nani. Major Honors: 18-Times Primeira Liga Winners | 16-Times Taca de Portugal Winners | 1-Time Taca da Liga Winners | 8-Times Supertaça Cândido de Oliveira Winners | 1-Time UEFA European Cup Winners' Cup Winners. Kit Manufacturer: Macron. Colors: Green and White. Key Players: Nani, Sebastián Coates, Bas Dost, Jérémy Mathieu. Main Sponsor: NOS, Super Bock. Team Mascot: Jubas. Last Season: Primeira Liga: 3rd Place | Taça de Portugal: Runners-up | Taça da Liga: Winners | UEFA Champions League: Group stage | UEFA Europa League: Quarter-finals. Since its foundation, Sporting has had six crests. Each of them included lion and green color. On June 2, 1981, the club was honored as Honorary Member of the Order of the Infante D. Henrique, and in 1986 with the Medal of Honor of Sports Merit. The club's main rivals are Benfica (Lisbon derdy) and FC Porto. However, despite the rivalry, both clubs have formed an alliance against Benfica. 18-Times Primeira Liga Winners: 1941, 1944, 1947, 1948, 1949, 1951, 1952, 1953, 1954, 1958, 1962, 1966, 1970, 1974, 1980, 1982, 2000, 2002. 16-Times Taça de Portugal Winners: 1941, 1945, 1946, 1948, 1954, 1963, 1971, 1973, 1974, 1978, 1982, 1995, 2002, 2007, 2008, 2015. 1-Time Taça da Liga Winners: 2018. 8-Times Supertaça Cândido de Oliveira Winners: 1982, 1987, 1995, 2000, 2002, 2007, 2008, 2015. 4-Times Campeonato de Portugal Winners: 1923, 1934, 1936, 1938. 1-Times European Cup Winners' Cup Winners: 1964. Sporting Goalkeepers: Emiliano Viviano Romain Salin Renan Ribeiro Luís Maximiano. Sporting Defenders: Marcelo, Sebastián Coates, Jefferson, André Pinto, Stefan Ristovski, Lumor Agbenyenu, Jérémy Mathieu, Bruno Gaspar. Sporting Midfielders: Bruno Fernandes, Stefano Sturaro, Rodrigo Battaglia, Radosav Petrović, Josip Mišić, Wendel, Nemanja Gudelj, Miguel Luís. Sporting Forwards: Marcos Acuña, Fredy Montero, Nani, Carlos Mané, Raphinha, Abdoulay Diaby, Bas Dost, Luc Castaignos, Jovane Cabral, Luiz Phellype. 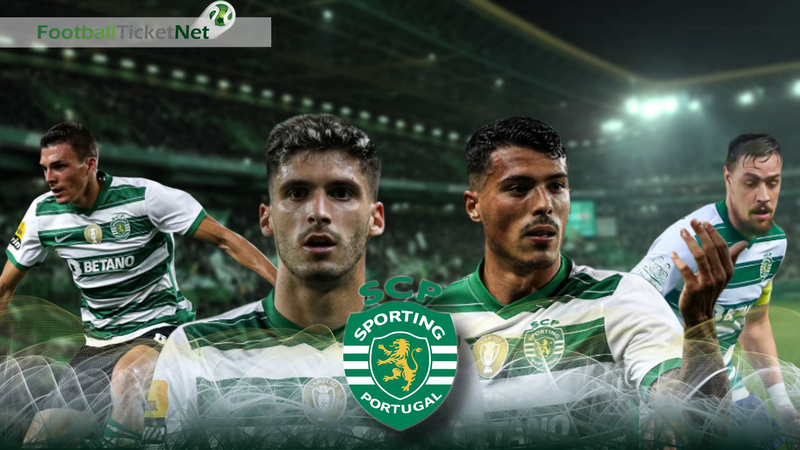 Sporting CP vs Belenenses tickets | Sporting CP vs Benfica tickets | Sporting CP vs Boavista tickets | Sporting CP vs Braga tickets | Sporting CP vs Chaves tickets | Sporting CP vs Desportivo das Aves tickets | Sporting CP vs Feirense tickets | Sporting CP vs Marítimo tickets | Sporting CP vs Moreirense tickets | Sporting CP vs Nacional tickets | Sporting CP vs Portimonense tickets | Sporting CP vs Porto tickets | Sporting CP vs Rio Ave tickets | Sporting CP vs Santa Clara tickets | Sporting CP vs Tondela tickets | Sporting CP vs Vitória de Guimarães tickets | Sporting CP vs Vitória de Setúbal tickets. Football Ticket Net offers all Sporting Lisbon home & away fixtures for 2018/19. Please browse through the selection of tickets on offfer and choose the right ones for you. The choice is huge. Please be aware that all Sporting Lisbon fixtures are subject to change date and time, which is out of our control. Please note that Football Ticket Net is not connected to Sporting Lisbon or to any official organization such as the Portuguese Liga NOS, or Taca de Portugal.